Today's review is a little bit different from what I regularly write, but it's a point that I consider it's important none-the-less. Oral hygiene is also a very important subject so I decided to write this! I've discovered this brand, LR Health and Beauty, this summer when my aunt told my mother about it. I'm normally up to discover new beauty brands but always checking if they're cruelty-free or not so, at first, I was a little sceptical about using it. However a few weeks ago I was browsing and noticed a lot of people were stating that this brand products cruelty-free! The main website that I use to see if a brand is or isn't doesn't say much about this brand so I'm still trying to find the truth. A concern is that their products are that cheap but sometimes they have some good deals. But, I have to say that I really enjoyed this toothpaste from them! 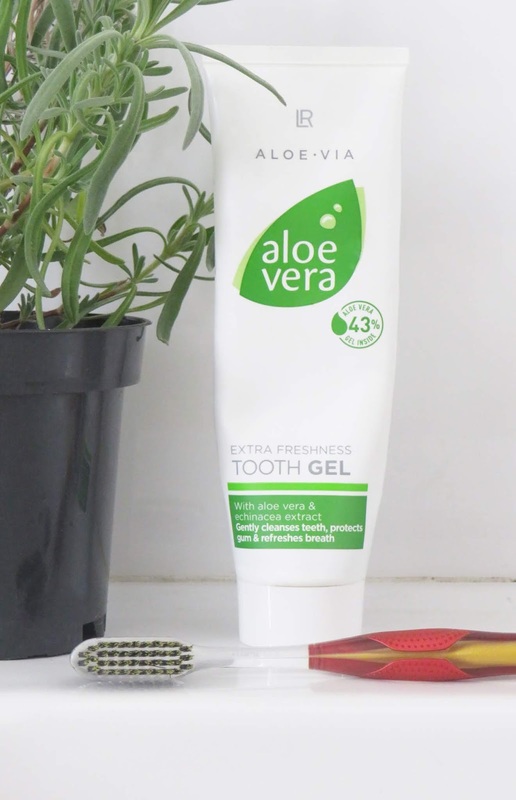 The product has 43% Aloe Vera, which is very positive that has the ingredient but maybe a little more would be better? I don't know! It gives a freshness after that I really enjoyed. You don't need a lot of it to clean your teeth and it helps defend the gums. Overall I really enjoyed the product and if the brand is, in fact, cruelty-free maybe I'll do more reviews about. Do you know something about the brand? Tell me in the comments!